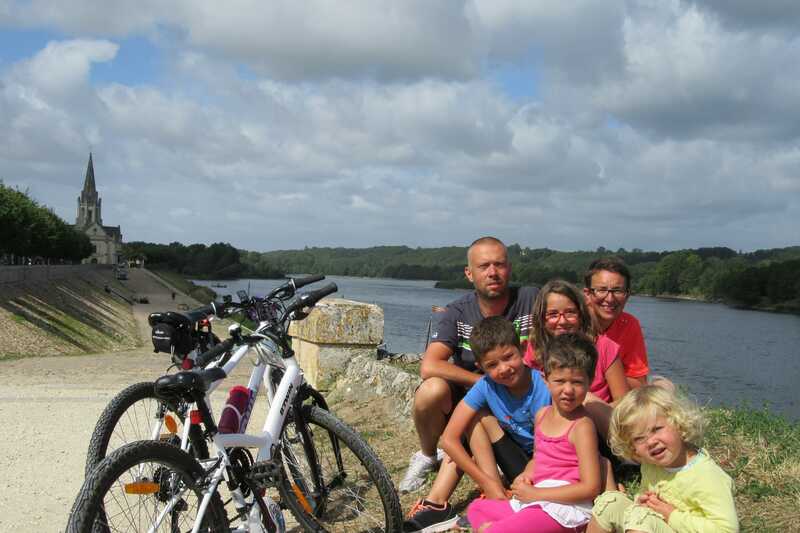 This couple from Angers and their four children took to their bikes to explore the Loire. Brimming with enthusiasm and energy, Valentine (11 years old) and Louis (8 years old) rode alongside their parents who had Pauline (5 years old) and Capucine (3 years old) sitting in little trailers behind them. They are going to share their experience with you. Julia from La Loire à Vélo: which La Loire à Vélo route did you take? We took the train from Angers to Orléans in carriages fitted out to carry all our equipment – 4 bikes and two trailers. Before leaving, we tested how many kilometres the 6 of us could do in a day, which was around 30km. Our goal: to get from Orléans to Saint-Brévin-les-Pins in 20 days (with some days of rest)! Our first day and our first lesson! Aurélie didn’t want to buy the bread for our sandwiches in Orléans, which meant we had to make an uphill detour to find a bakery. We arrived in Beaugency and fortunately there were activities for the children on the banks of the Loire (a bouncy castle, a merry-go-round, etc.) to cheer them up after that little mishap. We visited the beautiful Chateau of Chaumont. The roads were relatively flat on the way to the campsite, and we plunged straight into the swimming pool to relax when we arrived there! This part was very hilly! One of the trailers broke, so we had to spend an extra day at the Acceuil Vélo campsite. We couldn’t find anyone to repair the trailer, but fortunately my husband came across the part we needed on the internet and we had it delivered the next day! When we got to Amboise, we visited the chateau, which the children really loved. We stopped at a really great campsite with a huge inflatable for the children to play on. Despite the 34km we had just done, they were still full of energy. We, however, had a drink! We had a bit of trouble finding our way around Tours because some of the signs were difficult to read. However, we did find a really lovely route. When we arrived in Savonnières we were thrilled to discover that the village fair was on! In the evening there were lots of activities, fireworks and a real party atmosphere. We definitely came to the right place! The day started well with a flat tyre as Valentine had a tendency to cycle on the verges… After it was repaired, we went to visit Sleeping Beauty’s Castle which the girls totally loved! There were also several other families who were doing the same route as us, so we had the chance to share our experiences and impressions. Another flat tyre! This route had more stones and was hillier than the others, but there was a lovely part through Montsoreau, past cliff dwellings and vineyards. However, when we arrived at the campsite, it was full. As we were leaving, someone who had heard we were looking for another campsite advised us to go to Dampierre-sur-Loire which wasn’t too far away. It was for campervans, but there were also tent pitches. We were very lucky that day, plus the campsite was free! We found a great campsite with a view of the Loire plus the weather was brilliant! We spent the afternoon fishing on the banks of the river. The day ended with a beautiful sunset. We cycled through beautiful countryside on the banks of the Loire with a part further inland where there were market gardens. We arrived in a lovely eco-campsite. Everything was designed with children in mind and everything was shared. It was a bit strange to be staying so close to home, but no-one wanted to stop off there! And then the rain started… We arrived completely soaked and the next day it was the same again! We decided to stay in Chalonnes-sur-Loire where we hired canoes. It was a very windy day, especially on the embankments along the Loire. Fortunately, the wind was behind us. That day we were very well prepared, and everything was going to plan until my son broke the gear changer! My husband, who’s a bit of a MacGyver, managed to repair it. We were worried we would have to turn back! After a stop in Ancenis, we visited the Chateau of Oudon. The visit is really well designed and shows the route of La Loire à Vélo! The children loved it and were shouting “we saw that!” or “we went through there!” Then we went on a boat trip with a guide, which the tourism office had suggested. It was brilliant! On the way, we passed radish fields. Anthony took the opportunity to collect some which hadn’t been harvested, of course! The children played on the grass at Sainte-Luce-sur-Loire while we rested for a bit. Our goal was to get to the Migron campsite before it closed for a festival (there was just one day to go). We took the ferry at Couëron to cross the Loire. It was a long stage, this one, as there weren’t any other campsites around. But the walk along the canal was beautiful! We arrived at our destination to enjoy the sea air and the ocean stretching out as far as the eye could see. The children made sandcastles on the beach and swam in the sea! Julia: what was the highlight of your trip? We met lots of people in the campsites and on the journey. Everyone was lovely and had interesting stories and experiences to share. We felt like we were all one big happy family of La Loire à Vélo tourists! My husband found out about La Loire à Vélo in an article in the newspaper, about someone who had loved doing the 900km journey. We really wanted to do it with the children, and we were not disappointed!